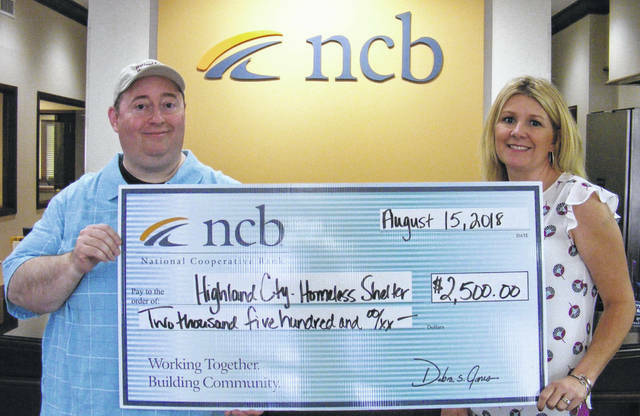 NCB recently donated $2,500 to the Highland County Homeless Shelter, which provides safe, temporary housing for homeless individuals and families and aids those homeless with the resources and referrals that will help them obtain and maintain permanent housing. Pictured are Greg Hawkins, (left) executive director of the homeless shelter, and Heather Cummings, NCB marketing manager. https://www.timesgazette.com/wp-content/uploads/sites/33/2018/08/web1_HighCtyHomelessShelter.jpgNCB recently donated $2,500 to the Highland County Homeless Shelter, which provides safe, temporary housing for homeless individuals and families and aids those homeless with the resources and referrals that will help them obtain and maintain permanent housing. Pictured are Greg Hawkins, (left) executive director of the homeless shelter, and Heather Cummings, NCB marketing manager.